Fidelity Home Health is a full-service Home Health and Home Care company owned and managed by Registered Nurse with over 20 years of extensive clinical experience in direct patient care in hospital settings. 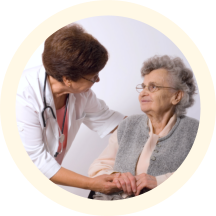 Our home health care experts will administer a similar level of care that is usually only provided in a hospital setting. Because most of the clients we attend to are disabled, elderly or ailing, long-term hospitalization is not the most preferred option for them. Many of our clients prefer to stay in the comfort of their home so they can be close to their loved ones. The Agency's mission is to provide professional and paraprofessional services to clients in their homes assisting them to achieve the highest level of potential in their day-to-day self-care activities. We are commited to providing high quality, multidisciplinary care by professionals who recognize the need for comprehensive assessment of needs from both the client and professional's point of view.